You are currently browsing the tag archive for the ‘sign of peace’ tag. This post on the Anglican Book of Common Prayer concludes a study of Church liturgy and Communion polity from the first century through the Reformation. The Church of England is a via media — middle way — between Lutheranism and Calvinism (p. 144). Doctrinally, it is similar to Calvinism. Liturgically, it is closer to Lutheranism. However, it is less prescriptive and proscriptive than Calvinism. It also has liturgical distinctions all its own. During Henry VIII’s reign, although the English Church broke with Rome, Mass remained a constant. However, small changes occurred with regard to church services. In 1536, the Mass in Latin was explained to the people so that they understood what was happening in the liturgy. In 1542, the Convocation of Canterbury decreed that all churches in England should have a morning and evening reading — one from the Old Testament and one from the New Testament — in English every Sunday and holy day. This included the main Sunday Mass. The litany was first said in English in 1544 (p. 145). An English liturgy took shape during Edward VI’s reign. 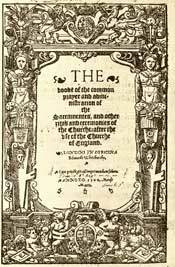 The First Book of Homilies, which contained 12 sermons in English, was issued in 1547. In March 1548, Archbishop Thomas Cranmer issued an English Order of Communion to be incorporated into the Mass (p. 145). These new parts of the liturgy included an exhortation to prayer, fencing the Table, invitation, public confession of sins with absolution, comfortable words (verses from the New Testament) and a prayer of humble access (expressing unworthiness to approach the Lord’s Table). Cranmer incorporated these rubrics into the first Book of Common Prayer (BCP) which appeared in 1549 (see illustration above, courtesy of Charles Wohlers’s site). He, along with a group of clergymen, including Nicholas Ridley (p. 146) and Martin Bucer, wrote and compiled the prayers. It preserved a rich treasure of liturgical material, the whole rendered in an English style singularly felicitous, dignified and chaste. The character of the collects was retained, the English style equalling the Latin, while the style of the Canon far surpassed that of the old rite. The achievement was unique in that the Book of Common Prayer, in contrast with the other vernacular rites of the sixteenth century, survives in use to this day. The current Church of England service book is Common Worship, issued about 15 years ago, replacing the 1984 Alternative Service Book. Since the mid-1980s, our clergy have been trying to eliminate BCP services. However, vicars who occasionally use the BCP find their churches fuller than when they use the modern liturgy. Doctrinally, the Church of England forbids either extreme belief about the nature of Communion. Specifically, church members are not allowed to believe in Catholic transubstantiation nor in Zwinglian symbolism (p. 144). We believe in an undefined Real Presence. Those receiving Communion were to kneel once they approached the Table. However, some early Protestants were concerned how communicants and those in the pews would consider this posture. WHEREAS it is ordained in this Office for the Administration of the Lord’s Supper, that the Communicants should receive the same kneeling; (which order is well meant, for a signification of our humble and grateful acknowledgment of the benefits of Christ therein given to all worthy Receivers, and for the avoiding of such profanation and disorder in the holy Communion, as might otherwise ensue;) yet, lest the same kneeling should by any persons, either out of ignorance and infirmity, or out of malice and obstinacy, be misconstrued and depraved: It is hereby declared, That thereby no adoration is intended, or ought to be done, either unto the Sacramental Bread or Wine there bodily received, or unto any Corporal Presence of Christ’s natural Flesh and Blood. For the Sacramental Bread and Wine remain still in their very natural substances, and therefore may not be adored; (for that were Idolatry, to be abhorred of all faithful Christians;) and the natural Body and Blood of our Saviour Christ are in Heaven, and not here; it being against the truth of Christ’s natural Body to be at one time in more places than one. A Communion liturgy was stipulated as being the norm. In the early days of the Reformation, churches mandated that at least some of their congregation receive the Sacrament on every Sunday and holy day (p. 146). In addition to the celebrant, a minimum of three or four persons was required (p. 149). Acknowledging that this might be more difficult at Wednesday and Friday services, the Church directives specified that clergy could truncate the service accordingly, omitting the parts of the Liturgy of the Upper Room which concerned the elements, consecration and Communion. The reason for mandating that certain members of the congregation receive Communion at each service originated from the requirement to receive the Sacrament at least once a year (p. 150). This was stated in the 1549 BCP. In the next edition, which appeared in 1552, the directive for minimum reception stated that congregations must receive Communion three times a year, one of these occasions being Easter. The 1662 BCP allowed Morning Prayer to become a standard Sunday and holy day liturgy. In practice, it became the standard as most parishes began to hold a Communion service only three or four times a year (p. 151). Until the late 20th century, Morning Prayer continued to be the norm on Sundays which did not involve a major Church feast. Today, however, nearly every Church of England service is one of Holy Communion. It is very unusual to find Morning Prayer on a Sunday. It is difficult to reproduce everything from the 1549 ‘Supper of the Lorde and the holy Communion, commonly called the Masse’ (pp. 147, 148). So much changed in the liturgy between then and 1662. Certain parts were omitted, reinstated and rearranged during that time. My notes follow in italics. – Peace and blessing (a possible reference to ‘The peace of God which passeth all understanding …’). The new liturgical book, Common Worship, has a traditional service which has reinstated the Kyrie and the Agnus Dei. The Gloria has been moved to follow the Kyrie. The Prayer of Humble Access is said immediately before Communion. Sadly, the Peace was restored in the 1980s, which is a shame in the 21st century; some churchgoers are, quite frankly, unattentive to hygiene. A Methodist told me that his church’s policy is to allow for a discreet tucking of hands into one’s sleeves to indicate non-participation. Only one person did that in his church, but the congregation respected it. The new traditional service is a great improvement on the one in the 1984 Alternative Service Book. However, no liturgy anywhere will ever top that of the 1662 Book of Common Prayer. It is a pity so many of today’s Anglican clergy refuse to use it more frequently. Such a refusal can only be considered some of Satan’s finest work. Following up on my post of six weeks ago, ‘The Sign of Peace abandoned thanks to flu?’, it looks as if this is now reality in some churches. Damian Thompson of the Telegraph (UK) blogs that the Liturgy Office of the Catholic Bishops of England and Wales has circulated guidelines — not much different to those that every household in the UK received from the NHS about swine flu — about prevention and cure. Yes, the production of these guidelines cost money. Yes, this was information we already had to hand. But, even better — on June 30, he reported that the Catholic churches in West Cornwall have banned the Sign of Peace with regard to physical contact. Congregants will now give each other a verbal greeting instead. The same churches may take further measures, such as withdrawing the chalice at Communion, depending on what the World Health Organisation decides what to do in upcoming months. Call me cruel and heartless, but if you want to shake hands with people, go to coffee hour or join a club. Church services are not the place to interrupt before the consecration for this type of thing. Especially when it’s an enforced practice that’s difficult to abstain from. I know the Vatican II types will disagree with me, but we got along perfectly fine without all this stuff for centuries. How our forebears managed to survive without touching each other during Mass, I’ll never know. The Sign of Peace abandoned thanks to flu? If there’s one good thing about the latest influenza outbreak it’s that churches might be abandoning a tactile Sign of Peace. For introverts like me, it’s difficult to shake hands out of context. Especially in the middle of a church service. If I have greetings to give, I’ll proffer them before or after. It’s just contrived, therefore, insincere. I don’t even know the people around me most of the time. My late father could hardly wait for Mass to be over so he could wash his hands. I just avoid it now, kneeling with head bowed whilst everyone else just dashes around the church. Let ’em go. Sunday worship is my one chance to ‘talk’ to God in a quiet, sacred, ordered place, so the last thing I want is people disrupting that peace. Peace as in prayerful ‘peace and quiet’. I do question the pop fellowship of meeting and greeting after the Lord’s Prayer though. The fact that hundreds were there together should be enough to express unity, but to force others to greet each other is a bit much. I dislike it when Protestants do it as well. Call me a grouch but the time for greeting is before and after the service, not during. Sure, I understand the symbolism, but I hear that for centuries, millions during the Latin Rite got on quite well without it. When you live and work in or near a metropolis, you are surrounded by people non-stop at least five days a week: public transport, the office, shopping areas. You’re in close proximity with strangers most of your life. The last thing I want to do at the weekend is be obliged to have physical contact with other people outside of loved ones or friends. The passing of the peace is an integral way that the assembly recognizes the presence of the peace of Christ in their midst. It is not necessary to eliminate the passing of the peace from the worship service. However, it may be advisable, based on your local situation, for the presider to suggest how the assembly may greet one another without handshakes. The verbal greeting paired with a reverent bow may be suggested. Alternatively, congregations may offer hand sanitizer for use after the passing of the peace in an inconspicuous way by placing sanitizer bottles at the ends of pews, in pew racks or under chairs. Sharing the Peace with a handshake: Shaking someone’s hand is one of the most common human behaviours we know. It symbolizes the act of welcome, it is a sign of friendship and it is a reflection of the bonds of a community. It can also be a means of passing on disease. Refraining from hand shaking when you have a cold, flu or infection is a considerate gesture. In the immortal words of Nancy Reagan: ‘Just say no’. Several Roman Catholic dioceses have also decided … to have a ‘no contact’ exchange of the peace. It would be great if this precaution became a habit. Now if we can just work on greater availability of mysterium tremendum rather than the New Age stuff. False smiles and forced handshakes are nothing more than simulated sincerity.